The storm projected to bring up to 7 feet of snow to the Sierra Nevada region through Sunday has arrived. As of Friday morning, 11/30, the storm has brought a 72 hour total of 21" of snow to Mammoth Mountain Ski Area, 16" at Kirkwood Mountain Resort, 19" at Sierra-at-Tahoe, 19" at Northstar California who also were able to open six additional trails yesterday, 18" at Squaw Valley, 11" at Heavenly Mountain Resort, 6" at Boreal, 6" at Sugar Bowl Resort (Re-Opening Dec. 1), and 12" at Alpine Meadows (Opening Dec. 7). While naysayers predicted that the incoming storm would produce heavy rain as opposed to the white stuff resorts and skiers covet, they were proven wrong, as all the precipiation came down in the form of snow at high elevations. Nevada's Mt. Rose - Ski Tahoe were glad to prove the doubters wrong, according to a press release from their Public Relations team, "Mt. Rose has received 11-16" of snow since this storm began...and it's still dumping! ALL SNOW - NO RAIN." 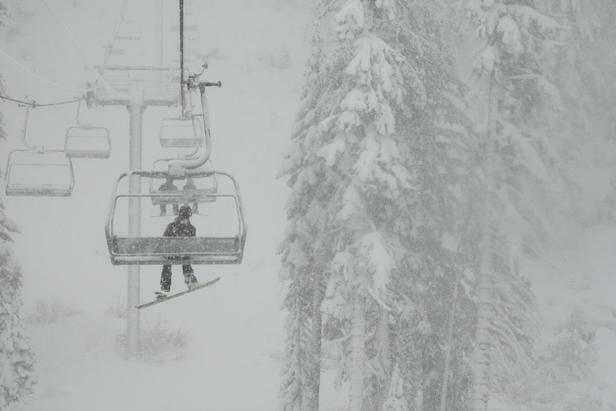 To keep up to date on the continuing snowfall in the Sierra Nevada make sure to check our California WebCams Page. As of 4:05 p.m. the snow has moved into Rockies, with resorts like Sun Valley, Powder Mountain, Steamboat and Jackson Hole seeing a lot of snow falling. Be sure to keep checking the 24 Hour Snowfall Page, and the Idaho, Wyoming, Colorado, Utah and Montana Snow Report Pages over the weekend.